Phil Mickelson, left, signs autographs after playing a round at the 2012 Arnold Palmer Invitational. An autograph can be a nice souvenir of the moment -- however brief -- when you meet your favorite PGA Tour player. Some autograph seekers enjoy collecting as many pro autographs as they can get, while others may seek an autograph as a gift for a golf-mad friend or relative. Whatever the reason, there are appropriate times and places to request a tour player’s autograph. 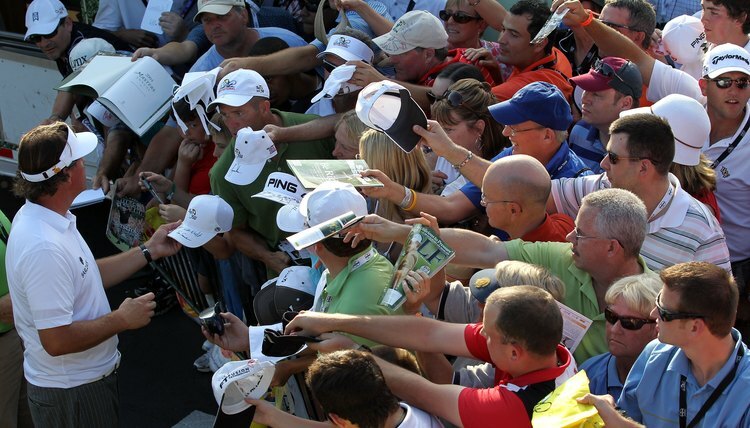 The PGA Tour has an autograph policy that applies to competitive rounds during tour events. The policy prevents players from signing autographs during a round, except when play is suspended. Some tournament host committees will set up an autograph area that players may use, at their options, before or after their rounds. Should a tournament committee set up an autograph area, the tour expects the committee to have marshals in the area to maintain order and provide “security for marquee players.” No player is required to enter the autograph area. The best days to get autographs of PGA players during a tournament week are the practice days before competition begins, typically Monday through Wednesday. Depending on the course and the tournament set-up, spectators may be able to request autographs at the practice areas or when players walk from the green to the next tee. Celebrity golf tournaments may also provide opportunities to obtain signatures, as they're not competitive events. Don’t expect to obtain autographs once competition begins at a major tournament, because players will be very focused on the task at hand. At the 2010 PGA Championship, for example, a no-autograph policy was established during competition. Spectators were permitted to request autographs during practice on the three days prior to competition, at the practice range and practice putting green. If you don’t mind paying for an autograph, shop at a site affiliated with Pro Tour Memorabilia, a company that’s licensed by the PGA Tour, so you can be confident that the autographs are authentic. If you live near a tour stop that includes a pro-am, you may also purchase the opportunity to not only meet but play a round with a tour pro. Additionally, watch for any publicity events in your area at which PGA pros may appear. Always be polite when requesting an autograph and understand that some players are reluctant to sign because so many people request a signature only to sell it. When approaching a player on the course remember that he’s there to work, even if he’s just practicing, and be respectful of his time.